The fall season is quickly come to a close, and if you haven’t taken the time to get outside to clean your gutters yet, you should strongly consider doing it right away. 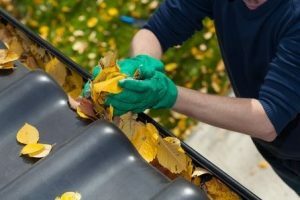 If you don’t clean your gutters out every fall–and in some cases, depending on where you live, every spring—you could potentially be forced to deal with a litany of issues in the foreseeable future. Clogged gutters can do thousands of dollars’ worth of damage to your home and ruin everything from your roofing to your siding. When you fail to clean your gutters out, leaves, sticks, dirt, debris, and more can build up in the them and prevent water from running cleanly through your gutter system. This water can build up in your gutters over time and stay there. It can spill out over the sides and run down the side of your home, and it can also freeze when the temperatures dip below zero and result in ice dams and icicles forming. These things can cause your gutters to pull away from your home, and they can also cause your gutters to fall off due to all of the extra weight they bring. In addition to damaging the gutter themselves, clogged gutters can cause issues with your roof. Your roof can sustain damage and start to rot when it’s exposed to water all the time. The water from your gutters can also spill and land below, pooling around your foundation. This can lead to foundation troubles down the line, which can be incredibly costly and put the structural integrity of your entire home at risk. Standing water in gutters can also attract pests and make your home very unpleasant. Not cleaning your gutters out in the fall can lead to a real nightmare. So you should make time to do it. You should also call on Roofing By Bruce at the first sign of trouble with your gutters or roofing. We can make repairs and help you with all of your gutter needs, including gutter repairs, gutter guards, gutter cleaning, and gutter repitching. Call us at 570-424-7250 today to schedule an appointment.